On the 4th of August I left Fremantle, Western Australia bound for Tokyo, Japan. The purpose of the trip was to catch up with an old friend who moved there and a holiday… as well as some light Fountain Pen shopping and checking out shops! Japan has a lot of Fountain Pen stores and a lot of Sailor products. Sailor produce my favourite inks and pens so the exclusives were definitely a focus of my visit! Ten days in Tokyo, and 1 day in each of Osaka, Kobe, Kyoto, Shizuoka, and Yokahama. Yokahama and Kyoto did not have much in terms of Fountain Pen shops and they were mostly visited for touristy reasons. Kobe had one store (and Kobe Beef), Shizuoka was entirely visited because of two fountain pen stores, and the bulk of the stores came from Tokyo and then Osaka. Because of a 1-week Japan Rail Pass that I bought before traveling to Japan, I was able to travel on the Shinkansen (bullet train) to make the trip to Shizuoka effectively free as the trip to Osaka and back to Tokyo essentially paid off the Japan Rail Pass by itself (had I needed to buy individual tickets). I strongly recommend the Japan Rail Pass if you are traveling a bit to different cities! Coming from Australia in winter and traveling to Japan in summer was quite the shock the system. Japan was not that hot from an Australian perspective but it was at least relatively hot and very humid. I do not handle that sort of weather well! Dry and hot is fine but humidity is not my friend. My best investment early was a handkerchief sized towel and it was definitely necessary! Japan is quite a cash society so don’t expect everywhere to have to have card. That said all the pen stores I visited (and tried to buy something on card from) did, presumably because no-one wants to be carrying around the ¥1,000,000+ cash needed to buy some of the Namikis and Nakayas for sale! Also worth noting is that it’s good to ask whether you can take photos as quite a few stores disallow it. I can’t say I understand why, but it is what it is! I also found that Japan spoke less English than the places I went in Europe six years ago. This certainly isn’t a complaint, just an observation! Brush up on some standard words and phrases though, it helps and shows you have have tried a little at least! Several pen stores have calendars up on their websites that show when they are closed (you can’t just assume they are open when their opening hours say!). Definitely take note of these, it caught me out because I kept forgetting them! Regarding Tax free items, some stores offer tax free such as PellePenna and Kingdom Note - possibly more. The issue with Tax Free is that what you are buying has to come to ¥5000 or over before you can qualify for tax free. However, consumables and non-consumables are separate so to get tax free on your entire shopping cart that contains both consumable and non-consumables at a store you need to spend over ¥5000 yen in both categories. Also, ink is considered a consumable (which makes sense). At PellePenna they wrapped the inks in a sealed bag that says not to open (with the risk being that if it was opened and consumed in Japan you might have to pay the tax at customs). When you buy tax free they will need to look at your passport and will staple or sticky-tape the receipt to it. Keep these receipts! At customs at the airport (past checkin and the bag check) you throw the receipts into a bowl (the people at customs will direct you to it). There are no questions asked at all. I opened my sealed bag of ink because I wanted to make sure the bottles were properly sealed and to pack them securely. I ran into no issues. For packing for the return trip I tightened every bottle lid (important for tall/vase Sailor bottles as they are often somewhat loose in my experience), I then bought ziplock bags from Daiso for ¥100 and wrapped each bottle and then put it back in the box. After that I packed them firmly and tightly in my checkin luggage with clothing and some bubble wrap to keep it in place. The bottles being next to each other isn't a risk unless they bump into each other so there shouldn't be any space to move; it needs to be tight! Now to the stores by city! I've included a link to the store's website (or something similar) and a Google Maps location. Tokyo had several stores, which makes sense as the Greater Tokyo area has more people than all of Australia! Kingdom Note is a small store on the eastern side of Shinjuku in Tokyo. The entrance is small but there’s a sign above it that it shares with another store in the building. Kingdom Note is a smaller store (but not the smallest I’ve encounted in Japan!) with dull yellow-coloured lighting. Lots of pens line the wall to the right after you enter, with inks behind the counter to the left. There’s a stand in the centre with more pens. They sell second hand pens, not all of which, I believe, are on display so definitely check their website. The helpful staff I dealt with didn’t speak much English (which isn’t a criticism!) so if you go to the store wanting something I suggest bringing a photo of what you want to help with communication (unless of course you speak enough Japanese!). Kingdom Note do Tax Free! 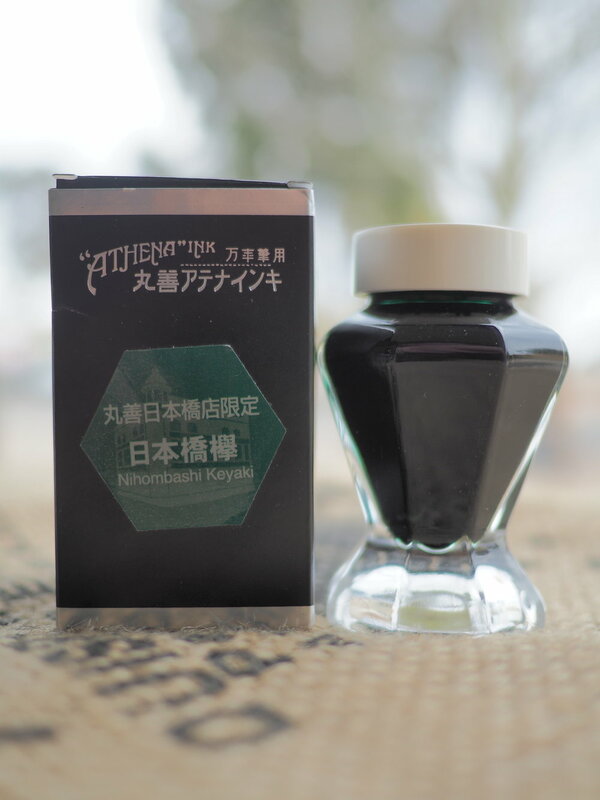 I picked up one 20ml Sailor ink from here, Hitamuki, but also picked up some inks and a pen for some pen friends back home (which I did in many of the stores). Below Kingdom Note is the multi-story Map Camera store which had several floors dedicated to several brands. They sell second hand stuff as well which I took advantage of with a lens for my Olympus! They also do tax free. Traveler’s Company was somewhat difficult to find. It’s underneath the North Exit of Tokyo Station Outside the ticket gate. I didn’t spend too much time here and decided against buying any goodies (despite how tempting it was!) I did, however, spend some time stamping my Travelers Notebook (actually a Midori!) with the free stamps they provide. I wasn’t allowed to take photos in here. It’s one floor down from street level and is quite decently sized A nice wall of inks and lots of cabinets of pens including a tucked away area for the pricy and very pretty Namikis. 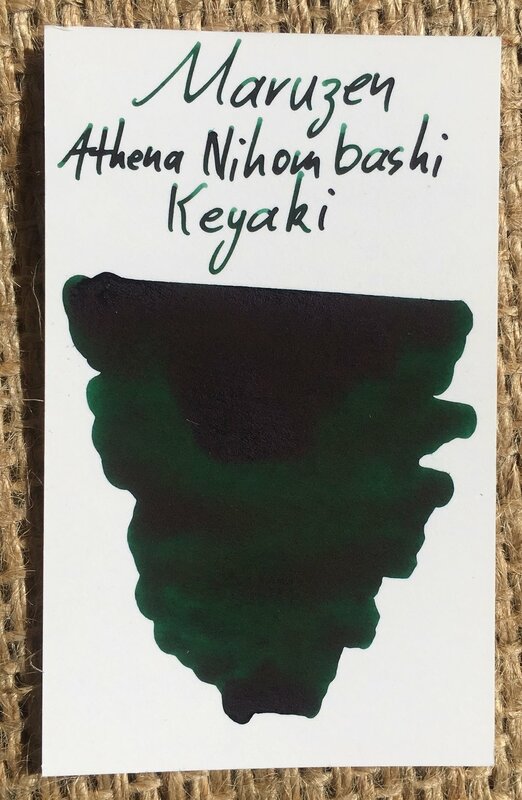 I grabbed the Limited Edition Maruzen Sailor ink of when I was there, Athena Nihombashi Keyaki. The Takashimaya department store is opposite the street from Maruzen and they rarely have some tall bottle Sailor inks in stock which might be worth a check. I don’t believe they speak too much English but it wasn’t needed for what I did, which was just bringing the inks to them to buy! This place is massive! It was late in the day and raining rather heavily when I went there so I wasn’t able to spend as much time exploring there as I wanted. There’s one store on the Main Street with a paper clip shaped sign and through the store and behind the main store is another store, Itoya K, with a Fountain Pen as the sign. Counterintuitively, however, the fountain pens are mainly located a few floors up in the main building. There’s an entire floor (out of many floors of stationery) dedicated to fountain pens. I spent probably half an hour here testing the Sailor Ink Studio inks. A couple were missing and a couple didn’t write properly but I got most of them down well enough! I grabbed Itoya Sailor Konpeki for myself as well as Sailor Ink Studio 935 and 941. I’ve heard stories that it’s quite slow and difficult to be served here. I can’t comment on that as, possibly due to the rain, I just walked to the sales desk and was served immediately. Again, no need for to use much English but at least one employee had some rudimentary English. PenPoint is a very small nondescript store but they pack a lot into it. It’s on the very outskirts of Tokyo and it’s also a place I waited until late in the trip to go to. The reason for that is that it was where I planned to make my big pen purchase from (and I wanted to make sure my budget was still healthy before I went there!). No photos again, nor tax free here, unfortunately! A few unique stuff here including some real bamboo pens with steel Sailor nibs, several very nice store exclusive Sailor Pro Gears, 1911s etc. and some store exclusive Sailor inks as well. I did come away with the Sailor pen I was after as well as an ink bundled with it (and a pen pouch). I very much love this pen! Some rudimentary English from the people here. Not enough for a conversation but enough to convey buying information. Very friendly people with, you can definitely tell, an interest in Fountain Pens. I was carrying the 2017 Fountain Pen Day tote “Musette” made by Rickshaw Bags and they seemed somewhat happy to have noticed it! It was a nice moment! Bungubox in Tokyo competes with PenPoint on smallness. There isn’t a lot of stuff in this store but they have definitely focused on the Bunbubox store exclusives. From maki-e TWSBIs, to the range of Sailor inks, to the Sailor pens and to the Kaweco. Lots of nice ink examples to help you choose. I was served by the very nice Kaoru who spoke a little English and it was great to finally meet! Bungubox can have some odd hours so checkout the calendar on their site before deciding to visit! This pen store is huge! So many cabinets filled with pens and another large one with inks. This place is close to Bungubox in Omotesando so if you visit one, drop buy the other! They don’t speak that much English. They have two Sailor tall bottles that are exclusive to the shop. I already had these but I picked one up to hopefully do a raffle with at my Pelikan Hub 2018 I’m hubmaster for. The entrance to this store isn’t obvious but it’s to the right of the sign which shows a fountain pen. Atman is another department store. I didn’t explore this place much and the inks I went in for were right near the sales counter. They didn’t speak too much English here. This place is a bus ride from PenPoint. I grabbed Tamaruri for myself. All the stores in Osaka, including Morita which was closed while I was in the city, line up with a single trainline running north to south. I ended up walking a lot of this but it was good to have them all in a row. No need to take multiple trains! We spend quite a while looking at a map in the shopping centre that Pelle Penna is located before finding the store. At which point we turned around and it was behind us and one store down… oops! Very friendly staff, how don’t speak much English, but were again somewhat happy and excited to notice my fountain pen logo’d tote! A decently sized store with some nice pens available and store exclusive tall sailor bottles. I grabbed Grotta Azzurra for myself. This store has nice range of stationery here as well as a decent line up of short Sailor exclusive inks and a couple of very nice Sailor pens (one of which was purchased for a friend). I grabbed myself three bottles; I quite like the orange-brown Sonezaki Toutou! Very friendly staff here! They don’t speak much English but were definitely eager to help and seemed to definitely be pen people. Again they noticed my fountain pen tote! Smallish store with plenty of nice stuff, especially the Sailor Exclusive inks. I grabbed the blue/purple Sanyasou ink. I definitely recommend coming here of you are in Osaka, and if you eat meat definitely try Kobe beef, it is very much worth the premium price for a once of meal at least! For Kyoto I took my swatches of Stationery TAG's Kyo-iro ink line which is based on locations around Kyoto. The plan was to go to each location (with the likely exception of Ohara which is a long bus ride from Kyoto) and take a shot of the swatch at each location. Unfortunately the day was hot and humid and we were slow meandering from location to location so I was only able to do this at three of five locations. I missed out on Frosting of Arashiyama (at Arashiyama), and Cherry Blossoms of Keage (at the Aqueduct in a temple in Keage). There was no moon but the yellow colours of the street at night aren't that far off from the colour of the ink (though it is still too red; maybe with a full moon that changes‽ - I doubt it). The design of the label features the Hōkanji Temple and the moon, I managed to capture the Temple at least! A real stone road in Gion is more pale than the ink "Stone Road of Gion". I imagine on a rainy day, however, the brownness and darkness of the stone bricks will come out. The label of the box features what I think is a geiko (a "woman of art" a local term distinct from geisha which simply means "Artist") holding a kyowagasa which is a traditional oil-paper umbrella. I don't believe I got a shot of a kyōwagasa but their are certainly people holding umbrellas. Flaming Red of Fushimi is a little redder than the orange paint at the Fushimi Inari Taisha shrine. The design of the label on the box features the stature of a Fox holding a key in its mouth that is at the shrine. I neglected to take a photo of this statue but went for the red of the Torii and the buildings which the ink is clearly inspired by. The Stationery TAG I visited, I believe, was not the main store. It was tucked within a bookstore and the staff were a little unsure of how to access the ink behind the cabinet (it seemed!). Was able to grab a couple of the exclusive inks though; the lovely red-brown Bengarairo and the surprisingly nice yellow Keihan (a railway line) Gion-shijo station which was a station near Higashiyama, and Gion and all the pretty places that are near there! Quite a big stationery store! Very friendly staff who, which I didn’t know, I already follow on Instagram! They have some lovely Sailor tall bottle exclusives (you can’t buy multiples of a colour!) and a couple of nice well priced exclusive Pro Gears as well. There are a few stores around Shizuoka. I checked out two. I’d definitely recommend the Toyoda store! I came away with Shosuoka Green Tea (which has a copper-gold sheen. More subtle than that of Pen's Alley Shaker Green) and Blue of Suruga Bay Summer which has some nice shading. Interesting to note that the Tomoe River passes through Shizuoka! Yotsuba is a stationery store that was near the train station of Shizuoka. They have a couple of stores throughout the city. The floor of the store near the Shizuoka Station when you walk in had all the fountain pens and inks including a set of Sailor tall bottle exclusives (again you can’t buy multiples of an ink). I was in Japan for two weeks and I feel I got a lot done. A decent amount of sight seeing and some fountain pen shopping (and seeing). I also managed to catch the Hobonochi release which was interesting (not much that stands out to me this year). I came away with a respectable haul of ink and a lovely pen and a lot of great memories. Also great to meet some people! I'm not sure how fountain pen people of Japan manage a budget! Living there all the time would put a serious strain on my will power to avoid blowing money! So many fountain pen stores, so many Sailor exclusives and then there's Itoya with its multiple floors of stationary supplies! I really enjoyed this trip and I'm pretty happy with what I brought back!